Stephanie Losee (Head of Content bei VISA) gehört zu einer der wenigen Pioniere im Bereich Native Advertising und hat bereits für beide Seiten gearbeitet. Als Managing Editor bei Dell war sie Launch Partner der New York Times Paid Posts. 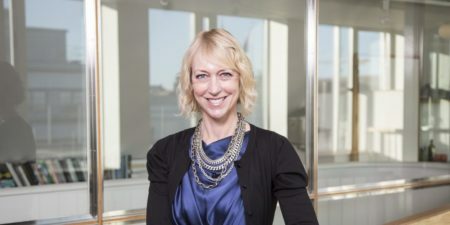 Bei POLITICO war sie als Executive Director of Brand Content für die Etablierung des Brand Content Studios verantwortlich. Sie gehört zu einem der zahlreichen Sprecher auf dem diesjährigen Native Advertising Days in Berlin am 16./17. November im Estrel Berlin. Melden Sie sich mit dem CODE NADVDZ16 an und erhalten Sie über unsere Kooperation einen Rabatt von 100 EUR auf den Teilnehmerpreis! Q: What have you found is the most critical element of a successful native advertising campaign? A: I’d have to say it’s publisher access to the editorial content lead at the brand. I think it’s obvious, but when I was working on pieces for advertisers at POLITICO, that kind of access was unusual. Rather, we would work with agencies that would then consult with the brand, but I found that often the agency didn’t understand what executives of the brand really wanted from the engagement, resulting in a lot of late-stage pivots that can undermine the success of the project. Q: Why do you think that happens? Why don’t brands participate more in the creative process? A: There are a lot of reasons. I think of content marketing as being fairly mature at this stage, but I’m often surprised to find that many brands still don’t have a managing editor or editorial content lead in place. I grant you it’s a tough hire, since the most successful ones are journalists who understand and love marketing and PR—unicorns,essentially. The other key reason is that brands are often thinly staffed in this function and need to hand off the work to agencies as much as they can. They prefer to weigh in on the development of the piece from time to time, but by then the project has often taken shape in a way that doesn’t reflect the business or messaging objectives they had in mind but might not have articulated to the agency. Q: What can publishers do to make native advertising easier for brands? Take the lead, which is hard because when you’re in the vendor position you’re always afraid you’ll make a wrong move and lose the deal or turn the piece into a one-off, which is frustrating for everyone after standing up what is essentially a new distributed team and working out all the kinks in the relationship never to benefit from the lessons learned and let it rip the second time. But when the publisher has a skilled in-house creative agency and the brand allows them to do what they do best, for the audience they know most intimately, it’s a beautiful thing to witness. Q: Could you share two good examples on a successful native advertising campaign that delivered great results and were built on a strong publisher/brand collaboration? A: My POLITICO team and I really enjoyed working with BP on a multimedia piece called “Journey Below the Subsurface of the Earth” that demonstrated how the company “sees” underground to find more oil in existing wells and identify new reservoirs without drilling. It was best practices in every way. BP’s Head of U.S. Communications Liz Sidoti was on the very first call and we worked with her team throughout to publish an impactful and visually arresting piece with off-the- charts time spent on page of over 4 minutes, which is well above editorial. Another was a series of two pieces we did for Leidos—one that leveraged a longform article and photo gallery they had created in-house and another we designed called “Hacker Avenue”. The latter was an interactive data visualization about the havoc cybercriminals can wreak on a city street that POLITICO readers also found highly engaging. These are the bespoke projects publishers’ studio teams live for, and I look forward to collaborating on similar work with an array of publishers now that I’m back on the brand side at Visa. We have one gorgeous execution in the works right now with a September-October flight that I can’t disclose yet—stay tuned!